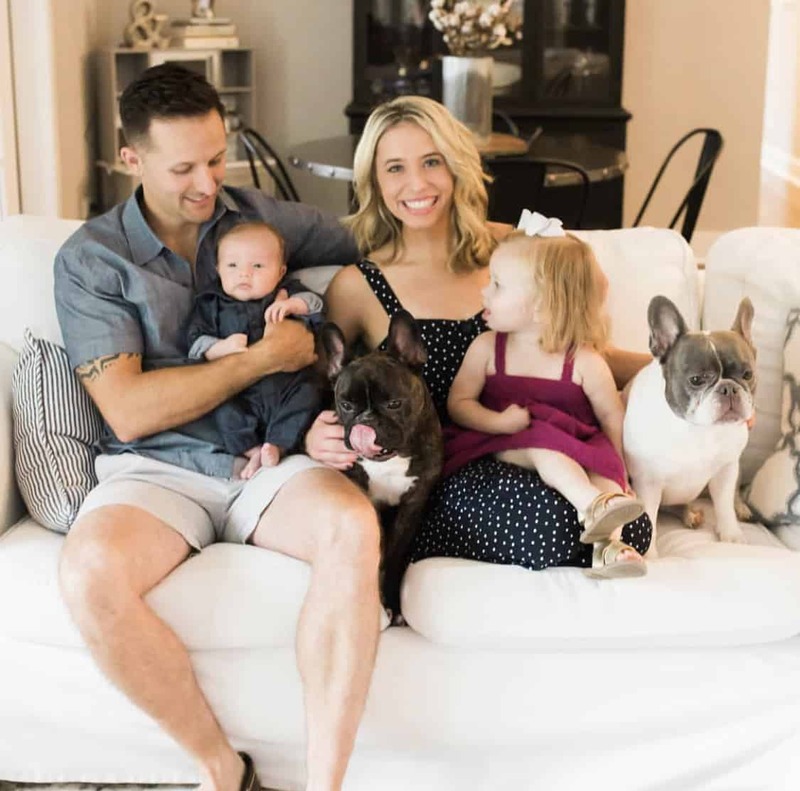 Hey friends, happiest Monday! How was your weekend? 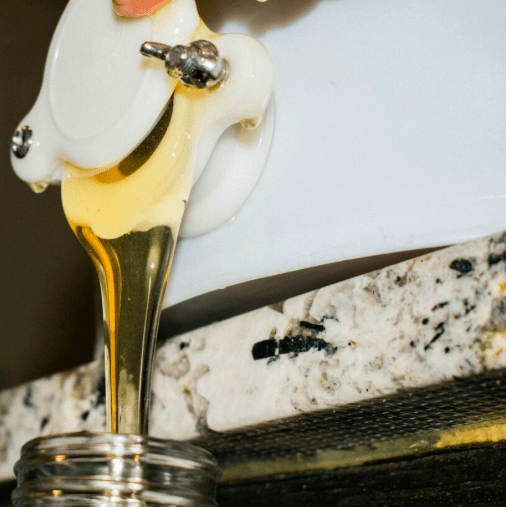 I’m so excited to finally share our full honey extraction post! 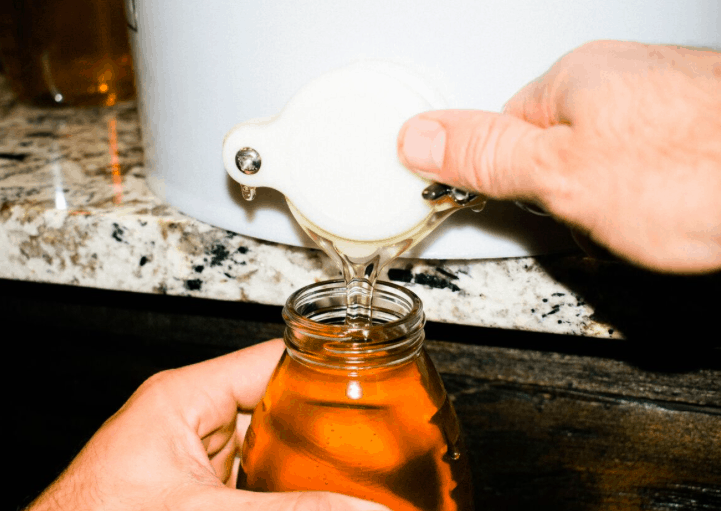 Keep on reading to get all of the details about how to harvest and extract honey. To be completely transparent, I do absolutely nothing to help with the beehives. Although I love having a ridiculous amount of local honey in our pantry at all times, I’m pretty much terrified of bees. 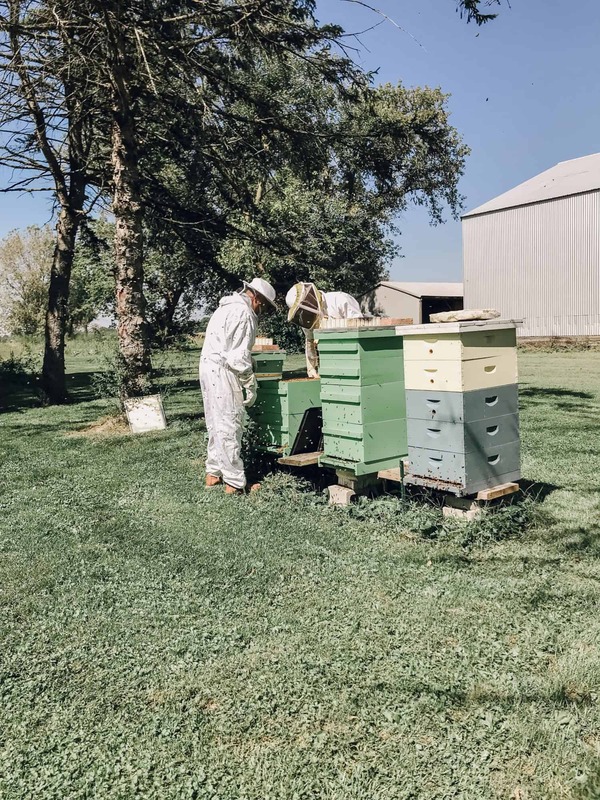 We currently have four beehives on the farm. Each hive has anywhere between 10,000 – 60,000 bees, so we have somewhere between 40,000 – 240,000 bees on the farm. Holy moly, that’s a lot of bees. Before we had farm animals, we had beehives. 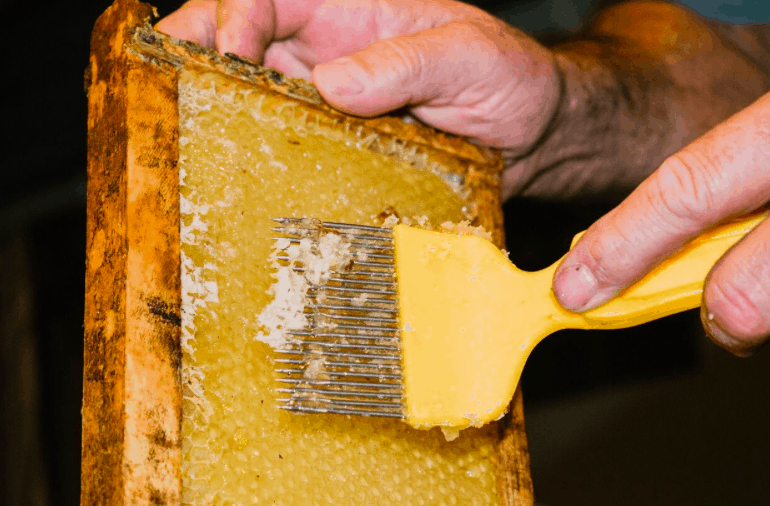 Beekeeping was basically a mini introduction to farming. Needless to say, we loved the idea of growing our own food, which led us to the decision to start a homestead. Last fall, we extracted more than enough honey for the year and sold the excess to friends and family. For year two, we decided to double our beehives on the farm. We currently have two hives that are especially strong, and two hives that are a bit weaker. We’re hopeful that at least two hives will survive the winter, but it’s a 50/50 chance. 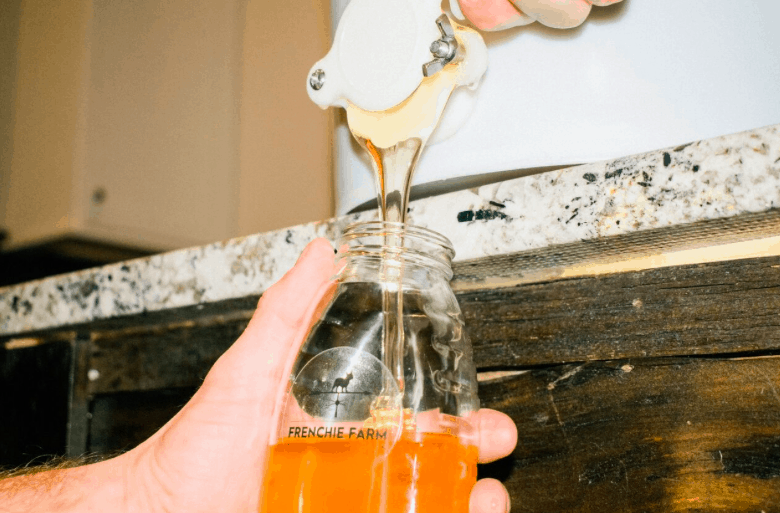 Harvesting and extracting honey on the farm is one of the most exciting parts of fall on the farm. 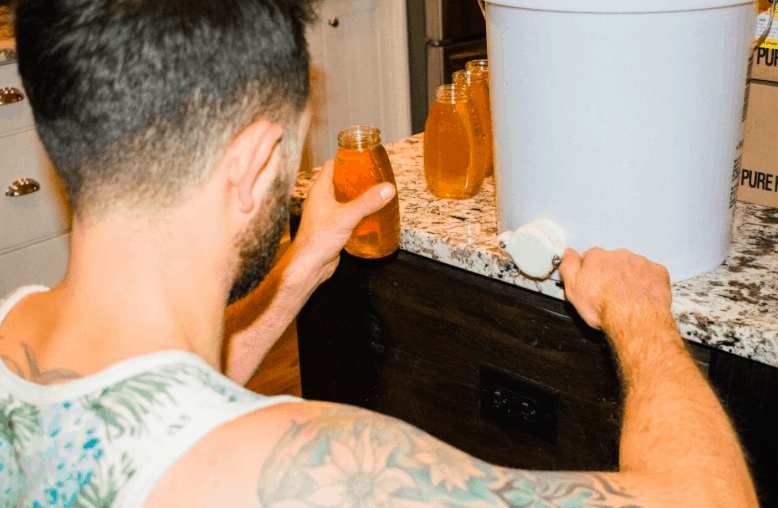 We never know exactly how much honey we’ll be able to harvest, so it’s such a fun surprise! Plus, local honey is an incredible way to treat seasonal allergies in a more natural manner. 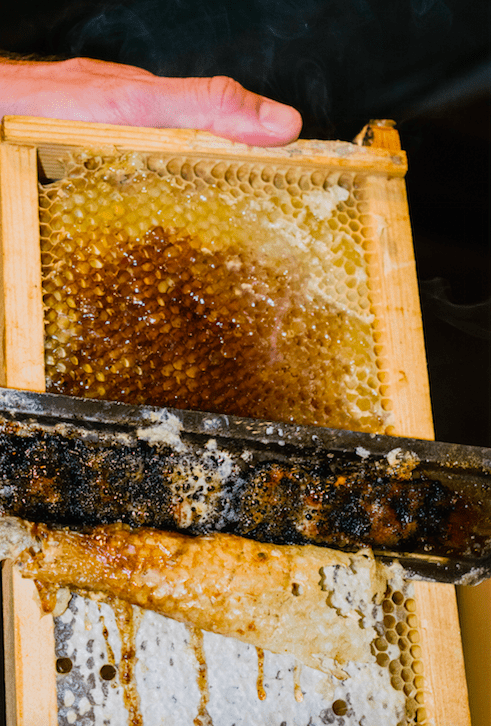 The first step for harvesting honey is pulling the honey box frames out of the hive. Ben and his dad geared up in their fancy schmancy bee suits and went to it. Next, we removed the wax cap from the honeycomb (i.e. uncapping) with a hot knife (i.e. uncapping knife ) We then used a pick to uncap the honeycomb around the edges of the frame and any honeycomb missed by the hot knife. Once all of the honeycomb was uncapped, we placed the frames in the honey extractor. 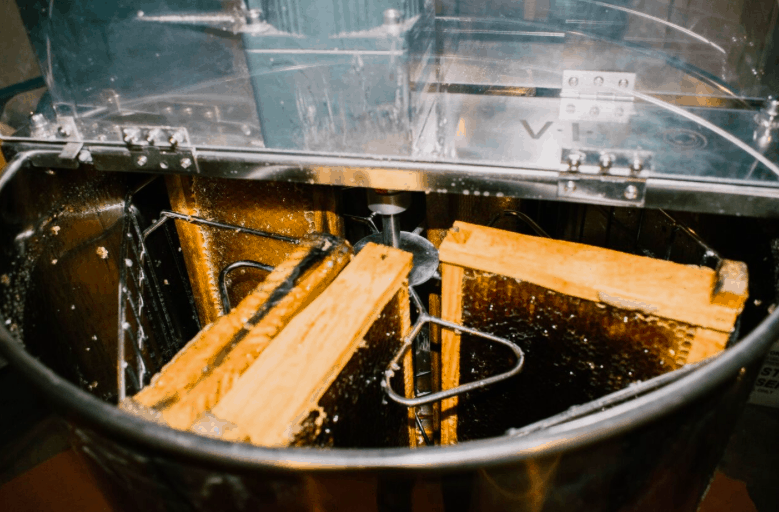 The honey extractor spins the frames to remove all of the honey. The honey does not need to be filtered, but we strain our honey with cheesecloth to remove any bee wings/stingers.